The Common Sense Values Resource Kit is a complete educational package to effectively teach the common sense principles of The Way to Happiness book to employees to restore trust, honesty and responsibility in the workplace. The kit is compatible with any company personnel program used by human resources directors, employee assistance professionals and others working with employees in business. A Facilitator’s Guide, comprising training modules combining all Way to Happiness materials in the kit with practical activities that fully engage participants. The Way to Happiness book, containing the 21 precepts of today’s most widely used common sense moral code. Two bundles of 12 are provided. 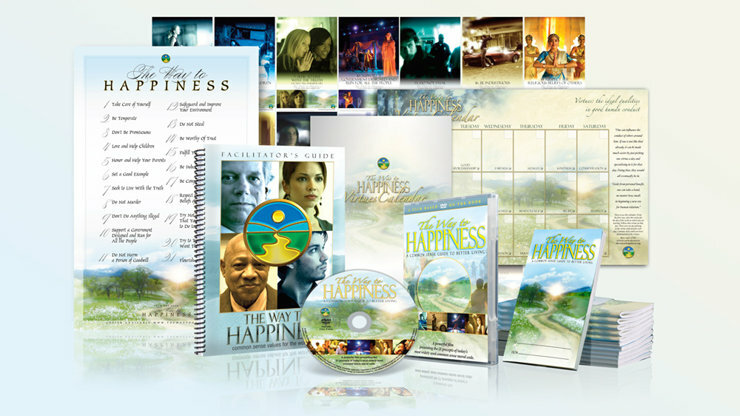 The Way to Happiness book on film DVD, the principal training aid for the program. Also included on the DVD are short (30 and 60 second) high-impact presentations of each of the 21 precepts. These complement the film and are part of the training curriculum. The Way to Happiness precepts scroll and posters, training aids to increase participant awareness and foster application of the common sense principles. One poster is included for each precept (21 posters) as well as a scroll with all 21 precepts. The Virtues Calendar, a practical tool to aid participants to practice the virtues described in The Way to Happiness book on a daily basis. 24 copies are included.